1. 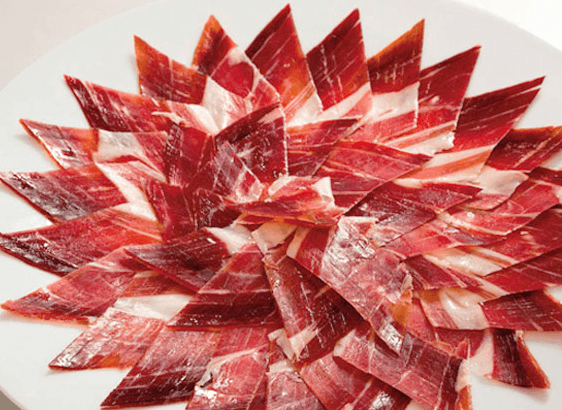 First of all, in order to enjoy to the fullest the flavors and aromas of an authentic Acorn-fed Ibérico Ham, it’s crucial to taste it at room temperature. This is around 70-75 degrees Fahrenheit (21-24 degrees Celsius). This is the ideal temperature for the ham to “sweat”. If you can’t have that temperature you can slightly heat the empty plate and then place the slices of ham in the warm plate (not hot, just slightly warm). You’ll see how the acorn based fat starts to turn transparent and melts, giving the ham its unique flavor and aroma. 2. All the slices in the plate have to be as uniform as possible. 3. The slices should be between 1.5 and 2.5 inches long. This is the perfect size to introduce the slice in your mouth and place in the palate to begin the tasting. We call it bite-size slices. 4. In terms of the thickness of the slices, the thinner the better. This is very important so the fat in the slice will melt in contact with the palate. 5. Do not over manipulate the slices while carving and placing in the plate. The goal is to maintain intact its aroma, flavor and pureness. 6. The best way to place the slices in the plate is putting only one layer of ham. Place slice by slice slightly overlapped starting from the outside of the plate to the center. The fat of the slice will face the inside of the plate. 7. Professionals prefer to use a simple white and round plate. And remember that we all have eyes bigger that our bellies, so the better looking the plate of Pata Negra, the more you will enjoy it! 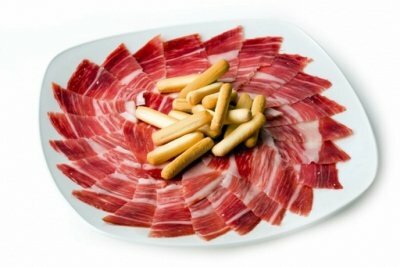 Visit us at www.ibericoclub.com to get the finest ham on earth!